Last weekend Morgan and I hosted our annual holiday party–something we look forward to every year. Certainly, there’s nothing like enjoying the good company of family and friends. We are, after all, very social creatures. 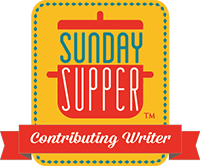 So, when the #SundaySupper crew announced a holiday party theme for this weekend, I dove in. 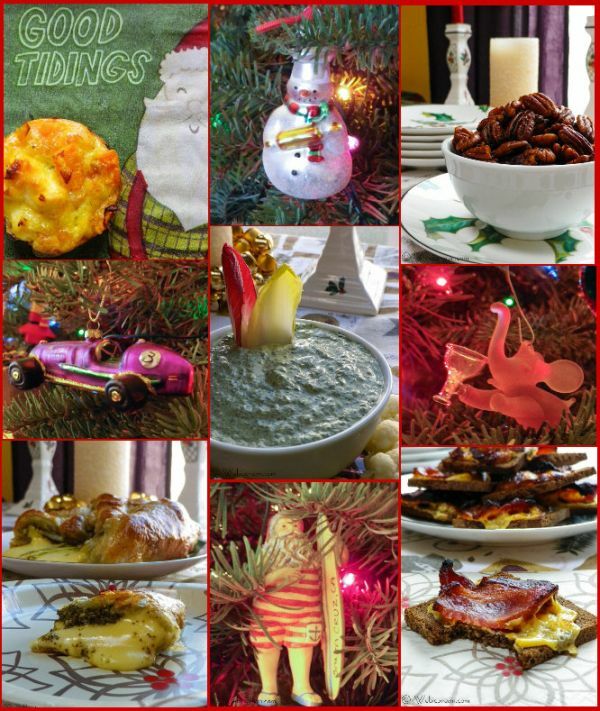 This week I have the pleasure of serving up five appetizers that are sure to tickle your taste buds: Spiced Pecans, Mini Sweet Potato Frittatas, Sour Cream Dip Florentine, Pesto Brie en Croute, and Bacon Cheese Toasts. Plus below is an assortment of beverages and even more appetizers from the rest of the #SundaySupper team. Since this week’s post is long on recipes, I’m departing from my normal step-by-step pictorial format to fit everything in. 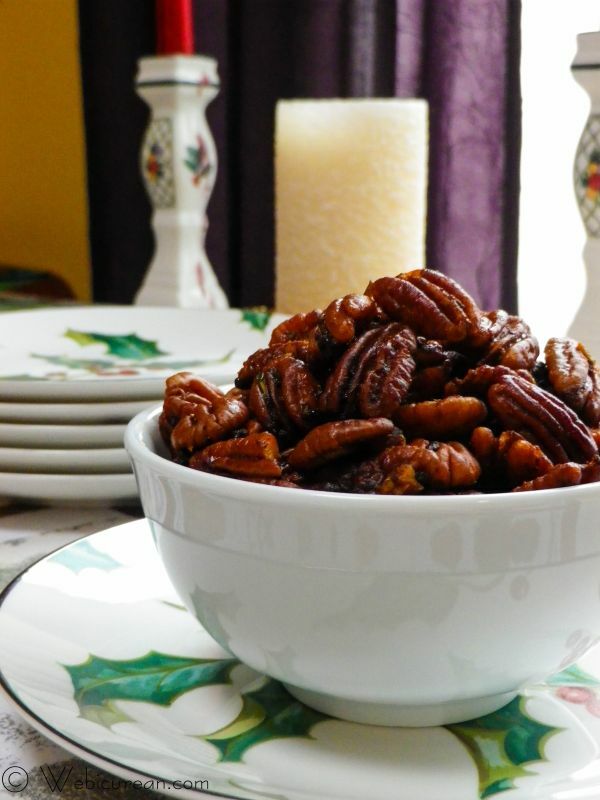 First, let’s start with the Spiced Pecans. This is a recipe I’ve adapted from Saveur–the pecans are browned in butter, then tossed with rosemary, along with sugar and spice and everything nice! Seriously, you may want to double up as these are quite addictive, thanks to the perfect meld of sweet and spicy flavors. Browned in butter, these pecans are fragrant with a heady blend of rosemary and spices, with just a touch of sweetness thrown in. Heat butter in a large skillet and brown pecans until toasted (about 5 minutes). Add remaining ingredients, stirring until pecans are well coated and fragrant (about another 2 minutes). Remove from heat, and transfer to parchment paper, spreading in a single layer. Cool completely. 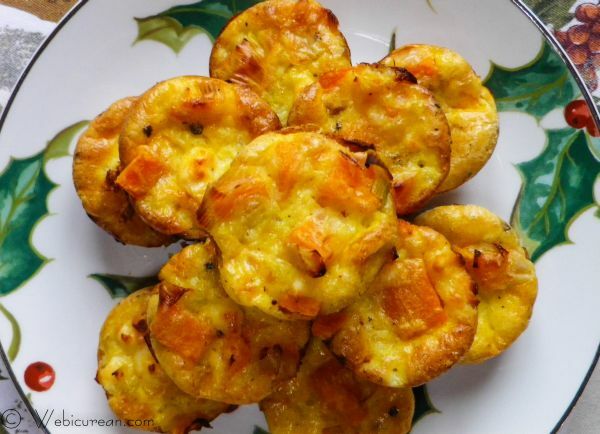 Now let’s move on to these Mini Sweet Potato Frittatas. While not as quick as the rest of the recipes here, they are a snap to throw together and are sure to impress. The blend of sweet potatoes with leeks and salty feta simply melts in your mouth. Since they can be served warm or at room temperature, these can be made ahead, so you’re not left with any last minute baking tasks. This recipe is adapted from Fingerfood by Bay Books. These frittatas are bursting with the flavors of sweet potatoes, leeks, and feta cheese. Preheat oven to 350, and grease mini muffin tins. Cut sweet potatoes into small cubes and boil until tender (about 5 minutes). Drain. In a large frying pan, heat the olive oil and butter, and cook the leeks until soft and slightly golden. Stir in garlic and cook for an additional minute. Cool, then stir in the sweet potatoes and feta. Whisk together the eggs, cream, nutmeg and salt and pepper. Pour egg mixture into each muffin hole about three quarters full. Gently press down sweet potatoes. Sour Cream Dip Florentine is simply a fancy name for spinach dip, I suppose, but it sounds so much better. The green onions and dill make this stand apart from the traditional version, and when paired with an array of winter veggies, it’ll be devoured with gusto. Who wants to delve into another platter of celery and carrots with ranch dip anyway? This recipe is adapted from McCall’s Cooking School . This fresh twist on the classic spinach dip is bursting with the flavors of green onions and dill. Remove spinach from package, thaw and drain well. Put all ingredients in a blender, cover and blend on high until completely smooth. Cover and chill until serving time. 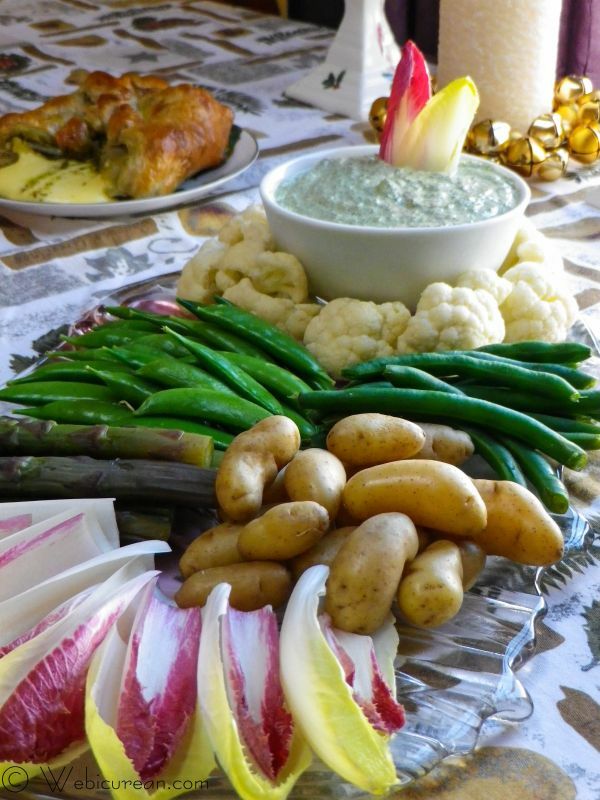 Pictured here served with endive, purple asparagus, fingerling potatoes, cauliflower, blue lake green beans, and sugar snap peas. Then there’s this Pesto Brie en Croute. I have my friend SarahJane to thank for this beaut. It’s crazy simple too–literally less than three minutes to assemble, I swear! Too, if pesto’s not your thing, skip it and top the brie with something else such as cranberry sauce or maybe fig preserves with chopped walnuts. The possibilities are endless. My pictures here don’t do it justice, but rest assured, it’ll disappear so fast, you better make two. 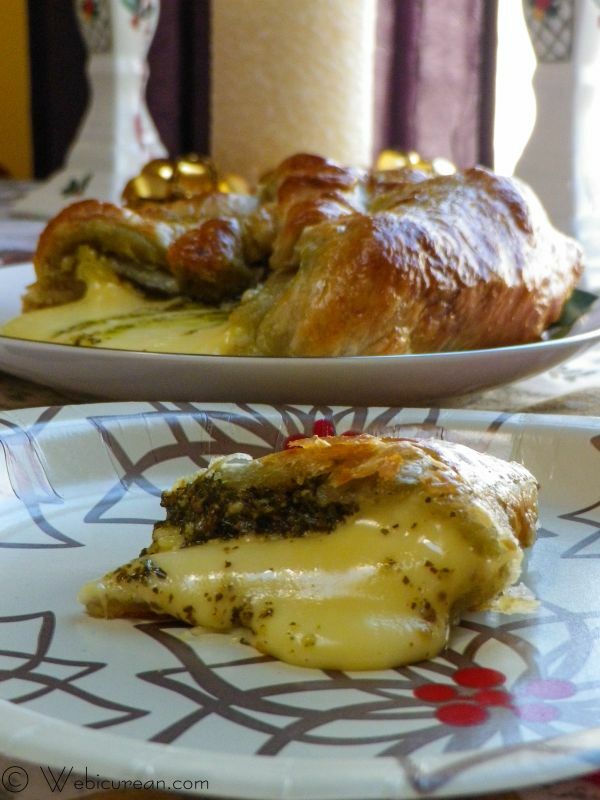 Creamy brie topped with pesto and wrapped in buttery puff pastry--what could be better? Spread puff pastry sheet on a floured surface. Place brie wheel (with skin on) in center. Spread pesto on top of brie. Pull corners of the puff pastry up over the brie and twist. Pinch and fold over corner edges. Bake until golden brown, about 20-25 minutes. 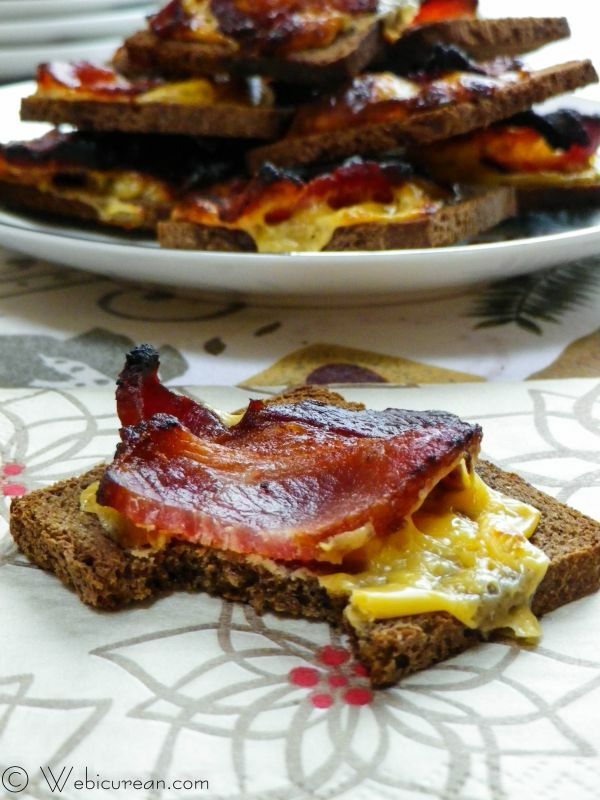 Of course, I’ve saved the best for last–Bacon Cheese Toasts, or as we call them around here, the bacon-cheese things. You’re probably looking at this picture and thinking, seriously? Yes, seriously. If I ever failed to serve these at one of my parties, there would be a riot–I kid you not. This is one of my mom’s creations, so it’s been a family standard for as long as I can remember. I probably made more than six dozen last weekend, and I couldn’t crank them out fast enough. I recommend getting these babies prepped in advance so that all you need to do is pop them under the broiler when you’re ready to serve. Cocktail rye topped with bacon and cheese. Need I say more? Cook bacon about three quarters of the way through. Drain completely. Spread cocktail ryes in a single layer on a cookie sheet. Top each cocktail rye with a quarter slice of cheese. Top the cheese with a piece of bacon. You can make as many or as few of these as you want. Typically I get the 3lb package of thick bacon, which requires 2½ loaves of cocktail rye, and 2 packages of the cheese. No matter how many other appetizers you're serving, people manage to eat more than 3 each of these, so make plenty! In honor of the Sandy Hook victims and their families, we have cancelled our regularly scheduled #SundaySupper Chat this week. Let this be a time when we renew our faith in the power of love and realize the importance of time with our families. Note: I receive a modest commission from any purchases made through the Amazon.com links above. I love sweet potatoes. I can’t wait to try out your dish. Thanks for sharing! It’s like a one-stop shop! I’ll take one of everything! Jen @JuanitasCocina recently posted..Fried Green Beans with Wasabi Ranch ~ #SundaySupper Christmas Apps &amp; Drinks Party! Great appetizers to share. Nice that they are quick and easy. Thanks for sharing so many great ideas along with the photos. I particularly love the sweet potato fritatas! They look fantastic!! OMG you outdid yourself. I’m going to make those pecans for sure. Maybe I can come over to your house? All your recipes are wonderful, so good! Wow, not one but five appetizers for us and they all look brilliant!! Wow, I love all of your recipes here!! Such great ideas for entertaining and nothing complicated 🙂 Love the sweet potato frittata and the spinach dip! Such great ideas here!!!!! 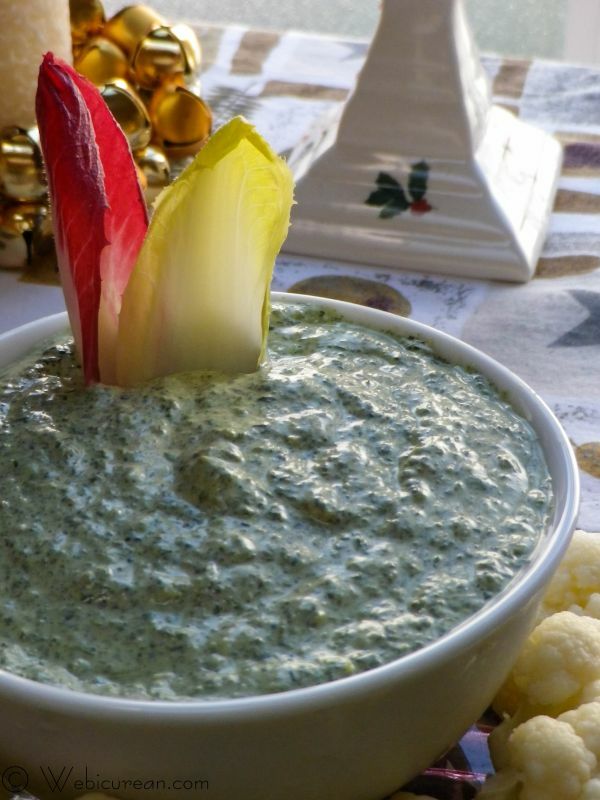 I love the pesto brie recipe…sounds so yummy! I am looking forward to the invite 🙂 – Everything looks fantastic!!! Lots of great ideas, good work! Great ideas, Anne, something for everyone! Oh my, what a great line up of appetizers! Stop it with the loveliness! All 5 of these look so amazing I have no idea how to pick a favourite, I guess I will just have to try them all. So very elegant, Anne. Thank you for sharing the stellar recipes. My mouth was open in awe the entire time I was reading your post. I wish I could attend one of your parties – every appie you made looks out of this world. I wouldn’t be able to pull myself away from the table! Thanks for bringing not only 1 but 5 awesome appies this week. Happy holidays! Great ideas! They all look amazing. WOW! Such great holiday appetizers! I’d rather eat these on Christmas Eve than the turkey I’m making! Happy Sunday Supper! You make one intense veggie and dip spread! And I love the savory brie. I’m used to sweeter versions with jams or chutneys, but this sounds great! Everything is so beautiful; I’m ready to dive right in!